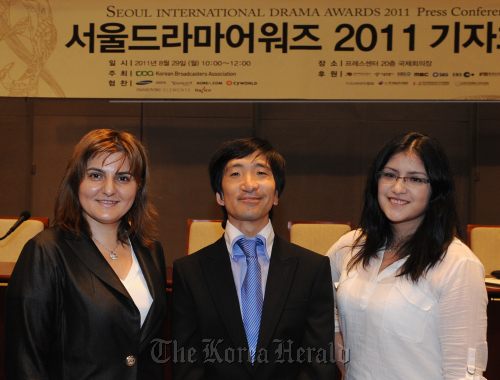 Hallyu fan club members from Peru, France and Romania stole the spotlight at the Seoul International Drama Awards 2011 press conference in Seoul on Monday. Though the awards’ final judging head Korean director Im Kwon-taek and Yahoo! People’s Choice Korean winner and K-pop idol Park Yoo-chun were present at the event, the press clamored to nab photos and interviews with heads of overseas organizations devoted to Korean culture. For the first time since its inception in 2006, the drama festival directly involved Korean Wave supporters from overseas. Ever since hundreds of French fans rallied for an extra concert from K-pop giant SM Entertainment this year, overseas Hallyu supporters have become celebrities in their own right. Among the most widely-covered set of Hallyu supporters is France’s Korean Connection, the organization that helped spearhead the SM Town concert demonstrations and who received major press when members visited Korea this year and met with SM boy band SHINee. Korean Connection president Maxime Paquet and approximately 40 members attended Monday’s press conference. Daniela Predut, president of RKIA in Romania, and Miluska Cabrera, SM Town in Peru’s Korea-based liaison head were also at the event. RKIA and Korean Connection promote Korean culture, while SM Town in Peru is a gathering of Hallyu fan club members dedicated to bringing an SM Town concert, which features SM’s K-pop idols, to Peru. Paris Diderot University Korean Studies professor Martine Prost also attended the press conference. 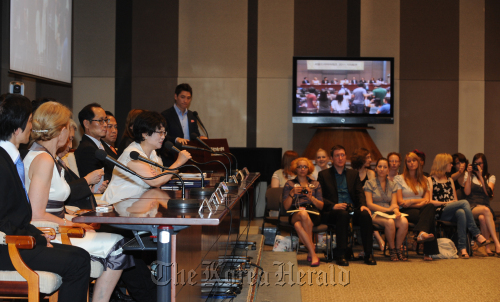 At the event, Prost, Paquet, Predut and Miluska Cabrera revealed the wide reach of Korean culture abroad. “It is true that Hallyu is very popular in Europe, especially in France,” said Prost, who stressed that Europe’s Korean Wave did not jump onto the scene overnight, but was the culmination of 50 years of growing interest in Korean culture. RKIA’s Predut explained how Hallyu has taken root in Romania, revealing that last year “the most popular drama in Romania was a Korean drama” and that starting last week K-pop is being broadcast daily there. Miluska Cabrera revealed that there were around 40 Hallyu fan clubs in Peru. The 21-year-old, who is currently studying here, also revealed that most fans are university students and that SM Entertainment’s K-pop idols are very popular in Peru. “SHINee is really popular,” she said. She also revealed that she herself is a member of a fan club for the five-member boy band. According to Miluska Cabrera, the reason why Peruvians like K-pop is because it is family-friendly and profanity-free. Amongst popular Korean dramas, she said that KBS’ “Boys Over Flowers” has been well-received along with its leading actors Lee Min-ho and K-pop idol Kim Hyun-joong. “All Peruvians have seen at least one Korean drama,” she said, stressing the widespread popularity of the genre, which she believes is a refreshing departure from telenovelas. While it looks like the Korean Wave is growing by leaps and bounds, it remains to be seen if it is just a fad or a long-term trend. If this year’s Seoul International Drama Awards serves as a sign of the future of the Korean Wave, then the future looks bright. This year 204 works, the largest number in its history, were submitted from 56 countries. Organized by the Korean Broadcasters Association and the Seoul Drama Awards Organizing Committee, the Seoul International Drama Awards 2011 will be hosted by Hallyu star Ryu Shi-won and actress Han Go-eun. Girl group T-ara, boy band Beast and K-pop singer Baek Ji-young will perform at the ceremony. Awards from seven categories will be presented. The ceremony will be held on Wednesday night at the KBS Hall in Yeouido and will be broadcast live on SBS.